Home / Embracing our connection / We are the ones we’ve been waiting for. In 2003, after President George W. Bush and his henchmen led us into an ill-advised, immoral, and illegal war in Iraq, I wrote a piece about how we can each make a difference even in dark and challenging times. Merely substitute “Donald Trump” for “George Bush” and “ISIS” for “Osama bin Laden,” and my essay is highly relevant today. 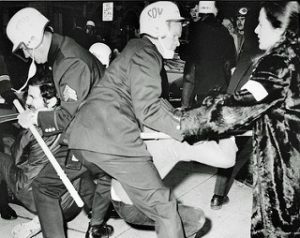 Around three decades ago I traveled from Tennessee to Washington, D.C. to join a protest against the war in Vietnam. My housing had been prearranged; the group I was traveling with would be staying with a family of Quakers. The weather that weekend in November tested our resolve: bone-chilling temperatures and a strong wind out of the north. 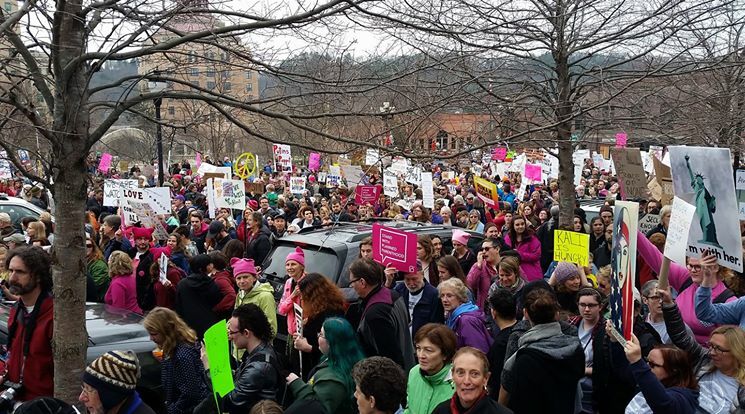 Nonetheless, we marched, we sang, half a million strong we came together confidently in common cause. I am of a generation which thought that we could bring peace to the world, and we didn’t think it mattered if we ourselves were angry. What we learned is that an angry generation cannot bring peace. Sometimes I’m certain that the apocalypse is upon us. My delusional president and his Mayberry Machiavellis continue shipping other folks’ kids (but certainly not their own) to Iraq to kill for peace even as things spin out of control there. The airwaves are awash with politicians who claim they care about you and me, but most only seem interested in advancing their political careers. Elected officials of both political parties dole out billions in corporate welfare while company officers make out like bandits and ship jobs overseas. The Patriot Act, passed after 9/11, is supposed to protect us from terrorists, yet many fear it leads us down the slippery slope toward fascism. The Asian Brown Cloud, an enormous haze of pollution two miles thick and seven times the size of India, is hovering over southern Asia, and the lives of millions are threatened. Eight hundred million people around the world go to bed hungry each night, and 24,000 die. Seventy-eight million acres of rain forest are destroyed annually, and 50,000 plant and animal species become extinct. The United States spends over two and one-half billion dollars every day on the military while one of every five children in the U.S. lives in poverty. Similar to the Titanic, our planet is rapidly approaching its “iceberg,” our physical limits to growth, yet our elected leaders seem content to merely rearrange the chairs on the deck. What then can we do to keep a level head and a loving heart in the midst of all this madness? How can we hope to bring about a more compassionate, just and sustainable world? For sometimes the temptation is great to turn away, to proclaim there is nothing that one person can do, to become cynical, to go into denial about the need to do anything, to go back to sleep. But once we have awakened, is unconsciousness ever really an option? I believe that each of us comes into the world utterly whole, inherently worthy, entirely blameless. And I believe that each of us, as we mature and become more conscious, deeply longs to make a positive difference in the world. Now, we may lose sight of that along the way. One may come to believe that the road to fulfillment is through the accumulation of lots of stuff—a fancy car, a bigger house, or tailored clothing. Or one may think that finding the perfect romantic partner will bring contentment (it might help). Or a great job and status in the community may appear to be the Holy Grail. But even if we achieve these things (or other similar goals), al l too frequently there is still a sense that something is not complete, some element of life is missing. 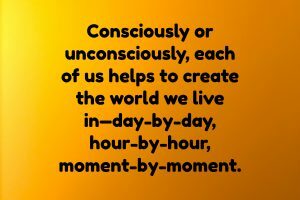 Consciously or unconsciously, each of us helps to create the world we live in—day-by-day, hour-by-hour, moment-by-moment. Every thought in our minds, every word we speak, every action we take makes a difference in our world. So then, the question is not “How can I make a difference?” The question is “What kind of difference do I choose to make?” If you choose to act out of love—smiling at the baby in the grocery cart in the long checkout line or contributing money, food, or clothing to folks in need—you help to create one kind of world. If you choose to react out of fear—snarling at the person in the slow-moving car in front of you or clinging to all of your material wealth for dear life—you help to create another kind of world. Many of us look around today and see a civilization in disarray. Many of us believe that our leaders have failed us. But the truth is, my friends, that the situation around us is our creation. If you want to discover what you really want, look at what you’ve got. The situation in our homes, in our community, in the U.S., in the world, is our responsibility. And if you want something different, it is essential that you think, say, and do what is necessary to create that change. No one else can do this for you. All around us are opportunities to make a difference. Life constantly sends forth a barrage of wake-up calls—the hungry child, the neighbor with cancer, the polluted air, the dying Fraser firs, airplanes crashing into the World Trade Center, the Iraqi family terrified at the onslaught of American troops. We ignore life’s wake-up calls at our own peril. Like the drunk who’s in denial, we may refuse to come to grips with reality. Like the pretense of a loveless marriage, we may be unwilling to confront the truth. But if we do not acknowledge the gift in even the most horrific event, discern its meaning for us, and adjust the course we are on, one thing is certain: When the Universe wants to get our attention again, to awaken us as individuals and a culture, we can count on the next wake-up call being even bigger than the one that came before it. Cynicism, denial, and hopelessness are merely forms of victimhood, placing the blame somewhere else for that which ails us. Let me suggest another way: radical responsibility. Rather than blaming others, this path requires us to ask ourselves at every challenge, “How did I help create this situation and what can I do to resolve it?” Sometimes this is not easy, especially when we are certain that someone else is at fault. But doing so puts us, not others, in charge of our lives. We are all here for a purpose. We each have a mission to fulfill—to discover our unique gifts and share them with those around us. You likely have a vision for a better world, and when you fully live your purpose you help to create that world. Some may call you an idealist or a dreamer; wear that title with pride. This is a time to surround yourself with those who nurture you, who understand and respect your hopes and dreams. This is a time to be with those who support you to walk your talk, to live your true values, not those so-called values advanced by our would-be leaders, public relations firms, and the mainstream media. Remember that everything happens for a reason. Yet even so, you are not relieved of your duty to do what can be done to alleviate the pain and agony of others. And you have a responsibility to deal with your own distress. For while you cannot control what life sends your way, you have complete control over how you will respond to it. You can create suffering for yourself by sitting around wishing things were other than they are, or you can do all that you can do and feel the satisfaction of your efforts and the results they produce. Pay attention to what’s going on in your community and in the world. Don’t try to hide from or close yourself off to the horrors taking place. When you see the starving children with bloated bellies, feel the hurt, feel the anguish, feel the anger. And use your feelings as a call to action. Quiet the chatter in your mind through meditation, prayer, contemplation, or a hike in the woods. Then listen. Each of us has a gift to offer the world, and we become aware of how we might offer that gift when we get in touch with our inner self. Perhaps you’ve always wanted to write a letter to your local newspaper, but your mind’s internal editor constantly heads you off at the pass. Ignore your editor and write it anyway. To make a difference in the world, become, as Gandhi says, the change you want to see. If you want a peaceful world, explore inwardly and find that peaceful part of yourself. Then rather than taking your anger and resentment out on your coworker for something he did or didn’t do, find a way to forgive . . . him and yourself. Since we are all in this together, there really is no “enemy.” We all want to love and be loved. Any action that is not loving, any action that is fear-based—abusive language, intolerant behavior, a violent act—is a cry for love, whether it’s coming from George W. Bush, from Osama bin Laden, from you, or from me. Service to others can present the next step on our spiritual or psychological path. If, for example, you offer a basket of food to a destitute family in a condescending manner, your gift might feed the flesh, but not the spirit—theirs or yours. And if you become conscious of this, you get an opportunity to understand the importance of humility and how your well-being is inextricably intertwined with those whom you might serve. Through the convergence of social movements—peace, civil rights, women’s rights, gay liberation, environmental and others—and personal consciousness movements—Gestalt therapy, body work, experiential workshops, meditation, et cetera—a new subculture has emerged millions strong. With a deep sense of the sacred in nature, a commitment to spiritual and psychological growth, and a willingness to support ecological sustainability, members of this subculture desire to live their lives congruent with their deepest values and beliefs. Despite the fact that this entire social phenomenon has gone unnoticed by the mainstream media, we are in the midst of an epic shift in American culture. And while some may become dispirited at its pace or with the violence and turmoil surrounding it, the transformation of our cultural paradigm is unfolding just as it should. 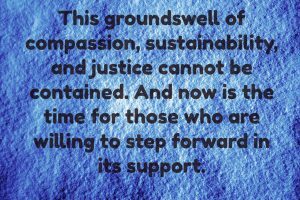 This groundswell of compassion, sustainability, and justice cannot be contained. And now is the time for those who are willing to step forward in its support. I’d like to close now by asking you to imagine that you have no concept of childbirth. Imagine that you have walked into a room in which a mother is in the midst of labor—with all the attendant wailing, straining, and gnashing of teeth. What would you think? What would your first reaction be? Today we are participating in the birth of a new cultural paradigm. Our world is in labor. And being a part of this chaotic and confusing process can sometimes be scary, sometimes awe-inspiring. But have no doubt that an irreversible trend is at hand—a movement toward greater love and respect for one another, for all living things, for the entire Earth. And, as always, we have a choice: We can let fear get the best of us and surrender to despair, or we can acknowledge ourselves for the role we play in this transformation and enjoy the creative process.